With blazing speed, intuitive operation, and unparalleled reliability, the Canon imageRUNNER ADVANCE 8200 Series delivers the outstanding output that high-volume offices, in-plant reprographic facilities, and print-for-pay businesses require. Today's fast-paced business world demands rapid turnaround with exceptional quality. 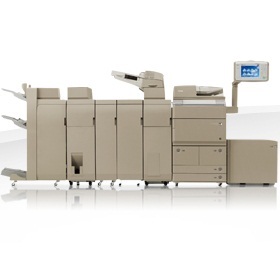 The imageRUNNER ADVANCE 8200 Series makes this easy with time-saving connectivity solutions, streamlined production processes, and expanded versatility options. It's all about a brighter, greener future. The imageRUNNER ADVANCE 8200 Series, registered in EPEAT, incorporates innovative, eco-conscious solutions that keep your business operating efficiently while helping reduce your environmental footprint. Coated paper can be loaded from the Document Insertion Unit only. When the Auxiliary Tray is extended.